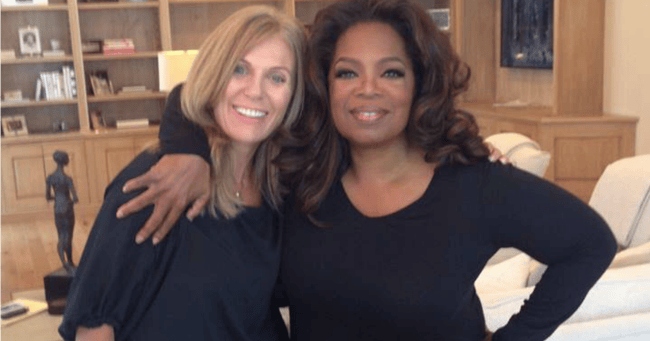 The Australian author who gave Oprah life-changing advice. Meet the Australian author whose advice led Oprah to make the biggest decision of her life. Oprah Winfrey is high up on the list of any journalist’s dream interview subjects. But Caroline Overington went one better. She met Oprah, sat down with her, did the interview and in the course of it, gave Oprah some advice that changed her life. “Wait, what baby?!?!? !” Oprah had a baby? She adopted a baby? How did I miss this vital piece of news? Ohhhhhh. I knew Oprah had been pregnant as a teenager. Vaguely. I knew she didn’t have a child now. Had she adopted it out? No. She’d been raped as a teenager, fallen pregnant at 14 and given birth to a son prematurely. He died in hospital within a couple of weeks and the whole traumatic experience had become her shameful secret until she spoke about it a few years ago. Naming him was something even more recent. That reporter was Caroline, who had interviewed Oprah for the Australian Women’s Weekly just a couple of months earlier and gave her that piece of life-changing advice. We talk about that in this interview which we did on the day her latest novel - the page-turning thriller The One Who Got Away - hit the #1 slot on the Australian best-seller list. There were hugs, high fives and some whoooping. Caroline is an extraordinary woman - she&apos;s not only a Walkley award winning journalist, she&apos;s also the author of 100,000 books - or close to that. From her memoir about moving to New York as a newspaper correspondent when her twins were toddlers to last year&apos;s biography of the last woman hanged in NSW to the series of blockbuster books that are begging to be turned into movies, somewhere along the way I was lucky enough to meet Caroline in person. I now wonder what I ever did without her in my life. Wise, warm and with a wicked sense of humour , she&apos;s one of my favourite people to hang out with. My only complaint is that I want her to write a new book every six months. Go on. Hear Mia&apos;s full interview with Caroline below.